Part of the surprisingly awesome Australasian scene, Pirana were an energetic Sydney-based quartet who first appeared in 1971, issuing two albums on the Harvest imprint before the usual lack of success truncated their all-too- brief career. For the interested, both of their albums are easily attainable on CD, yet, rather annoyingly, original vinyl copies of each are now worth a small fortune - around $400.00 as of 2016 - and they don't pop up very often. Despite it's proximity to the rest of the world, Australia, and latterly New Zealand, did manage to cultivate a small scene of psychedelic and progressive groups, mainly gathered around the clubs and bars of Sydney, Auckland and Melbourne. The likes of Spectrum, Rainbow Theatre, Bakery, Ticket, Mantis, Sebastian Hardie, Band of Light, Ayers Rock, Tamam Shud and Tully showcased a vibrant selection of styles, whether it be acid-licked blues-rock or jazz- influenced symphonic rock, and much like Pirana, original vinyl copies of most of the above are now worth ridiculous sums of money(as of writing, their is a single copy of Memento's 1972 effort 'Bakery' for sale on Discogs for just under $2,000). With a sound influenced by latin rock outfits Santana and Chango, Jimi Hendrix, British prog and late-sixties garage- rock, Pirana's debut is all heavy guitar-and-organ interplay and colourful instrumental flourishes, though multiple listens also reveal a debt to such non-prog luminaries as Chicago and even early Blood, Sweat & Tears. Featuring a line-up comprising Tony Hamilton(guitar, vocals), Stan White(keyboards, vocals), Graeme Thomson(bass) and Jim Yonge(drums), the first album is arguably the stronger of the two, yet truth be told the difference is minimal. The same line-up would begin work on 'Pirana II' in 1972, but just a few days into recording keyboardist Stan White was replaced by Keith Greig, which goes some way to explaining the second album's guitar-heavy sound. 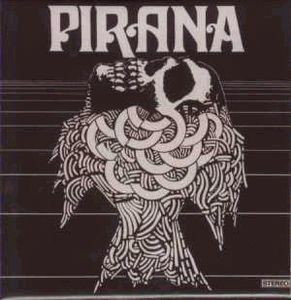 Unfortunately, despite backing from EMI, neither of Pirana's albums made much of a mark on the Australian charts, or anywhere else for that matter, and following the lukewarm reception of 'Pirana II' and the constant struggle to find gigs and make a resonable living, the band split in early 1973. The Australian scene may have been small, and very far away, yet it produced a remarkable number of excellent albums in a very short space of time. Pirana, with their spicy organ runs, busy guitars and energetic jamming make for an excellent entry point for those wanting to take the plunge, and both their albums are highly recommended.